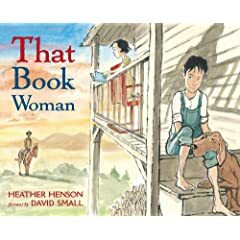 I love David Small’s illustrations, so That Book Woman by Heather Henson immediately caught my eye. And the illustrations are gorgeous. 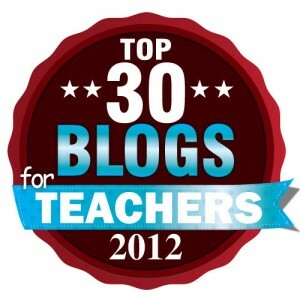 But it’s also a great story and one I plan to read with my class next year when we begin the new school year. This is the story of a boy named Cal who lives way up in the Appalachian mountains during the 1930’s. Cal is a good boy who enjoys helping his Pa with the chores, like plowing and chasing after wayward sheep. What he doesn’t understand is why his sister, Lark, just sits around reading most of the time. Cal can’t read and has a hard time understanding the value of those “chicken scratches.” He sees no use for reading- they live an isolated life in the mountains! When a woman shows up one day with a sack full of books, Cal worries that his Ma and Pa are going to trade his berries (for pies!) to get books. But then that book woman says the books are free! And she will show up on horesback about every two weeks with new books! Cal doesn’t believe her, but she isn’t lying. Through rain and snow she comes, with new books every time.